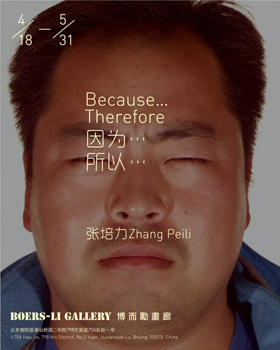 Boers-Li Gallery is pleased to announce the opening of Zhang Peili's solo exhibition Because...Therefore on April 18th, 2014. This is his second solo exhibition in the gallery, and his first solo appearance in Asia since his retrospective in Shanghai’s Minsheng Art Museum in 2011. This exhibition will feature three new works: two video works and his first ever sound installation. As Zhang Peili’s first experiment into new territories, the sound installation, Collision of Harmonies, takes up the entire length of the gallery’s second floor. A metal track runs from end to end with two old-fashioned loud speakers—the kind used on school fields or as the town crier’s messenger in rural China—gliding along the tracks. The speakers hang on opposite ends of the track; a man (left speaker) and a woman (right speaker) simultaneously sing a warm-up exercise as the speakers migrate toward each other. As they draw closer together, a feedback noise starts to hum, at first quietly, then screeches when the speakers finally meet in the middle, and subsides as the speakers move apart again. Fluorescent light tubes are scattered and shine on the floor directly below the point of collision. Zhang’s works have always been intertwined with multi-layers of meaning, commenting on social, political and personal issues. This sound piece also delivers: It reflects the presence, or failure, of communication, technology, control, gender roles, as well as cybernetics—the interaction between human and machine. The escalation of disturbance reflects the discordance and anger when communication fails, the futility and frustration when technology falters, the resistance and violence when control breeches the threshold of tolerance, and the fury and perturbance when one fails to control. As the study of cybernetic implies, feedback is universal. All actions have reactions that are just as important and are just as, if not more, damaging than the original action. Collision of Harmonies provides a symbolic and vivid imagination of what the reactions could be—be warned, it is shrill. Image Unveiled, one of the two new video works, is an interactive piece where a LCD screen appears blank at first, but as more viewers see the work, more of the image pixelizes on the screen to reveal a healed scar. This is reminiscent of his famous 1996 piece Uncertain Pleasures, where a hand continues to scratch the skin, giving the viewers an eerie simultaneous pleasure and discomfort when watching the video. Speaking of discomfort, sunglasses are called for when watching Portraits of 2012, where images of a stranger flash on a 5x3m screen at 8000 lumens in front of your eyes with a resounding bang. The size is over-powering, the brightness blinding, but you are not the only one: The strangers in the video also experience a similar jolt and squints with you as they flash on screen. Whether you are shocked, blinded, deafened, or all of the above, you will definitely come out of the exhibition slightly altered from when you entered. As the exhibition title Because...Therefore suggests, the show is an open-ended sentence for each audience to fill in everything in between for themselves. As for the artist? He makes art.